Its about time I made one of these. I was just sticking my mat in a lululemon bag. It didn’t fit in the bag, so I’d zip the top as far as it would go with my mat sticking out the top. And then slinging the bag strap diagonally across my chest while riding my bike to class. It was awkward. Every time I’d adjust the bag while biking, I would say to myself that I needed to make something functional. 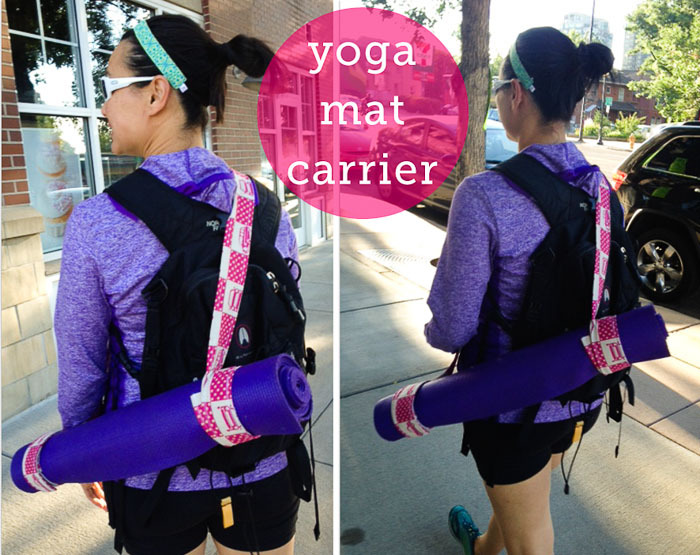 I waffled back and forth between a strappy carrier or an all out yoga mat bag and I settled on a strappy carrier. Making this was really simple, I don’t know what took me so long to actually make it. I have been hoarding Echino fabric for far too long, with no real idea what to make from it. The fabric is heavier than regular quilting cottons, and its almost as stiff as canvas. It has just enough structure for the strappy carrier without having to add any interfacing. Following this tutorial, I threw it together in about an hour Friday evening. Well, all except the Velcro. The only Velcro I had in my sewing supplies is the sticky kind, and I’m positive that my sew-in Velcro is in a box somewhere in Miles’s closet. He was asleep when I stitched this up, so I put it aside. Well, I ended up sewing in the sticky velcro because I just can’t find the other stuff. Which didn’t work out so well. The thread kept sticking to the needle and not actually sewing. I had to re-sew parts of it after cutting off some thread and re-threading the needle. I got it all stitched down eventually, but the seams are a bit of a hot mess. Oh. If you decide to follow the linked tutorial, measure the circumference of your yoga mat. Mine is much smaller than the one in the tutorial and I ended up having to adjust the straps before attaching the Velcro. I just folded them in and stitched the strap to itself to shorten them. Gotta love the husband support! 😎 Thinking about yoga myself, when I can find extra hours in my day! Yeah, JJ is pretty great! And you should definitely try yoga. It’s made a huge difference in my life.